With the American government in partial shutdown and other politicians accusing him of ‘temper tantrums’, it seems President Trump can’t find the support he desperately wants at the moment. The main sticking point is Trump’s dogged determination to follow through on his campaign promise of building a wall between Mexico and the US. He’s asking for $5.7 billion as funding to build his physical barrier between the two countries which, in his mind, will be quickly made back once the wall is built. However, as The Washington Post points out, the wall would do little to stop illegal drugs entering America, as they ‘primarily come in through legal points of entry, making the cost of illegal drugs irrelevant to this issue.’ In fact, Trump made six false or misleading claims in his recent address. Anyway, to the more light-hearted stuff, which is very much needed in these trying times. 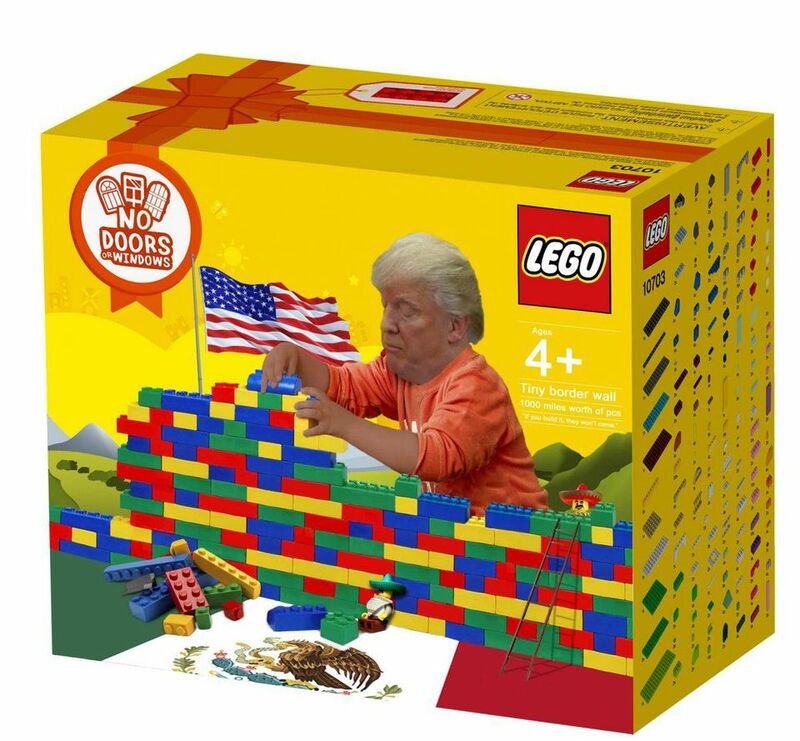 One Lego enthusiast and right-on Photoshop user mocked up some brilliant play sets for us all to enjoy while we await the erection of Trump’s massive wall. 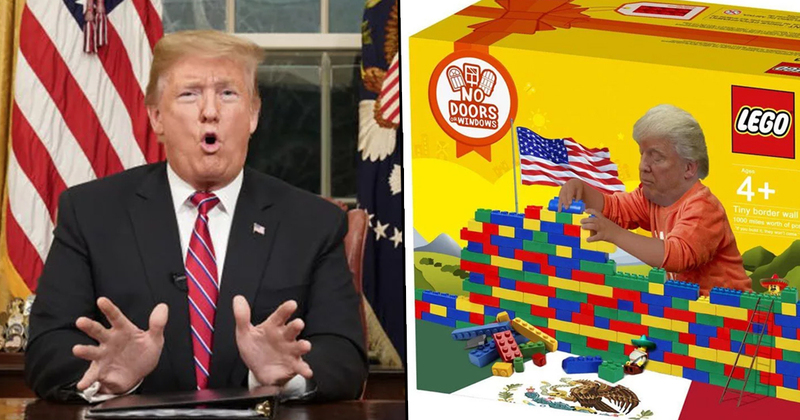 The Lego set takes its inspiration from, obviously, Trump’s wall, but also his marvellous, child-like delusion wonder. It was created by a Reddit user called Chris, who goes by the handle Balderdhash, in 2017, but has since been going viral thanks to recent political events. The inspiration came from a combination of recreational cannabis and the media attention the wall was getting, I simply saw the subject trending and ran with it. It got a lot of laughs at the time and I didn’t concern myself with any negative comments, I was having fun. At first, Chris posted his creation on Reddit’s r/TinyTrumps, which houses many photoshopped images of the president being miniaturised and inserted into various scenarios. However, after being posted in r/Pics, it’s since been doing the rounds thousands of times. In other news, a gambling site is having to pay out thousands of dollars after people placed bets on whether Trump would tell more than three and a half lies in his Oval Office address. Bookmaker.eu gave people the option to bet on how truthful the president would be in his speech. They offered odds of -145 for more than 3.5 lies, and +115 for less than 3.5 lies – which means if someone bet $145 that Trump would lie at least four times, they’d win $100. Turns out, he did tell a few untruths, and now the bookies are paying out around $276,424, according to BuzzFeed News, with 92 per cent of people who placed bets wagering that the president would lie. The maximum online bet was limited to $2,000, however some people reportedly requested to bet more, with the biggest wagers being $25,000, $20,000 and $15,000, all in favour of Trump racking up the lies.